Dr. Amos Gyau, a Ghanaian national, joined FARA as the Lead Specialist for Capacity Development in March 2017. He holds a Ph.D. in Agribusiness Marketing/Management from the University of Göttingen in Germany. 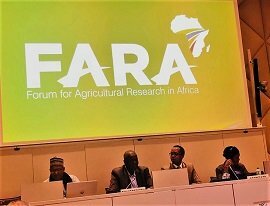 Prior to joining FARA, Amos worked as a Research Leader in Market and Institutions at the World Agroforestry Centre (ICRAF) from October 2010 to March 2017, where he provided scientific leadership in the field of agribusiness, marketing and value chains development. In particular, Amos oversaw the work of regional and country marketing teams including partners, young scientists, consultants and students of diverse backgrounds and nationalities. His interest was in designing strategies for linking farmers to markets, farmer organizations and value chain development, and the related institutional and policy arrangements. Before joining ICRAF in 2010, Amos worked with the Food and Wine Business group (now Global Food Studies) at the University of Adelaide in Australia, on research-for-development projects. He also taught courses including Wine and Food Marketing Principles, Business Management for Applied Sciences, and Logistics and Supply Chain Management. Amos has authored/co-authored more than 60 scientific papers including 40 peer-reviewed articles in leading agribusiness management and development journals on a wide range of topics such as supplier relationship management, linking farmers to markets, post-harvest management, and farmer associations. He has also supervised more than 20 PhD and Msc students. He brings to FARA extensive experience in research, project management and human resource capacity development.